A really fun project sent into us by Thomas Meghe. He’s translated it all from his native French, which is a technical achievement itself. If you’d like to see the original, you can find it here. Bored of your favorite Twitter client ? No problem, here’s the solution ! 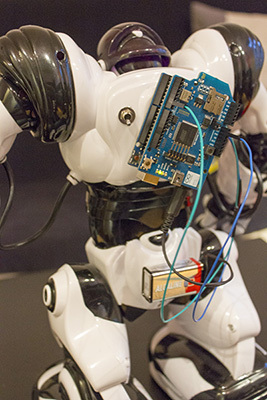 In this post we are going to explain how to control the awesome WowWee Robosapien with a wirelessly connected Arduino to trigger some actions on the robot through a specific Twitter hashtag. See the project here on MAKE.